Piracy at sea is at its lowest level in six years, with 264 attacks recorded - a 40% drop since Somali piracy peaked in 2011, a maritime watchdog has said. 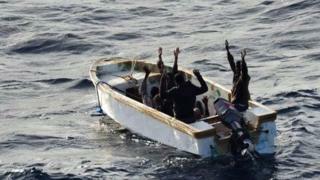 There were only 15 incidents off Somalia last year, the International Maritime Bureau (IMB) said. This is down from 75 in 2012, and 237 in 2011, its records show. Armed guards on ships, international navy patrols and the "stabilising influence" of Somalia's government had helped deter pirates, the IMB said. "The single biggest reason for the drop in worldwide piracy is the decrease in Somali piracy off the coast of East Africa," Pottengal Mukundan, IMB's director, said in a statement. "It is imperative to continue combined international efforts to tackle Somali piracy. Any complacency at this stage could re-kindle pirate activity," he said. IMB's annual global piracy report said more than 300 people were taken hostage at sea in 2013 and 21 were injured, nearly all with guns or knives. Indonesia saw the most pirate attacks last year, accounting for more than 50% of all incidents. But the report said they were "low-level opportunistic thefts, not to be compared with the more serious incidents off Africa". Piracy off West Africa made up 19% of attacks worldwide last year, the report said. Nigerian pirates, who accounted for 31 of the region's 51 attacks, were "particularly violent", killing one crew member, and kidnapping 36 people to hold onshore for ransom, the IMB said. In November, a UN and World Bank report said pirates operating off the Horn of Africa, which are some of the world's busiest shipping and humanitarian aid routes, had netted more than $400m (£251m) in ransom money between 2005 and 2012.